has reinvented papel picado in New Mexico. On September 18, eight New Mexicans will receive the prestigious Governor’s Arts Award. This month we take a look at five: a papel picado artist, a weaver, two pinhole photographers, and a concert-band legend. Check back in October for more winners. When she was six years old, Catalina Delgado-Trunk learned to cut designs from paper at school in Coyoacán, an artsy old Mexico City neighborhood. “I just absolutely loved it. I was the messiest one. I had paper all over myself, all on the floor. There was a nun teaching kindergarten, and, boy, would she get mad at me,” she says. “She finally made a crown for me that said Reina del Desorden—Queen of Disorder. Now 70, Delgado-Trunk is Albuquerque’s laureled empress of papel picado. The Mexican folk art is familiar to anyone who’s admired the lacy paper cutouts that festoon Day of the Dead altars and other festive scenes, but her museum-quality work goes beyond folk art, staking out its own place in high culture. “Almost single-handedly she has created a new traditional art form in New Mexico, relying on the skills she grew up with,” Andrew Connors, the Albuquerque Museum’s curator of art, told the Governor’s Awards committee. But the story of just how she grew up and rediscovered those skills is far from orderly. 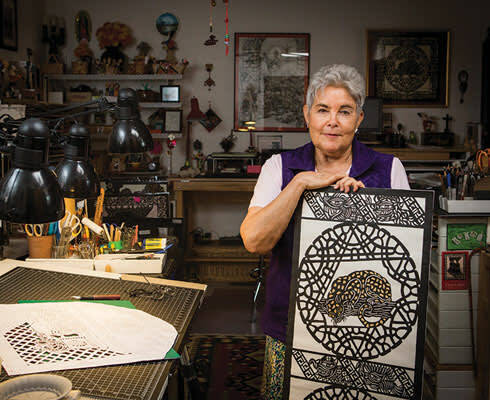 By the time she and Jim moved to New Mexico, in 2000, in search of a state that would be more understanding, Delgado-Trunk had made so many altars that she’d given up decorating them with imported papel picado and begun cutting out her own designs. She reconnected with the art form during an extended stay in Mexico City in the 1990s, where she returned to seek out her roots. “I had lost my identity. A midlife crisis, if you want to call it that,” she says. Folk-art workshops at the Ciudadela Market put her back in touch with the pleasure of working with paper—and, just like that, she became queen again. New Mexicans loved her papel picado from the start. It was perfect for Albuquerque’s Día de los Muertos celebrations, and although Spanish Market declined her application on the grounds—mistaken ones, she argues—that the form lacked Colonial credentials, her early calaveras and catrinas were a hit at Contemporary Hispanic Market. Encouraged by admirers at the National Hispanic Cultural Center and the Museum of International Folk Art, she continued to push the boundaries of the art, plotting intricate, singular pieces that explore the history and mythology of the Spanish-speaking world. For all her interest in history and tradition, Delgado-Trunk feels the secret of her work’s appeal is its impermanence. “I like paper because it’s ephemeral, and to me life is ephemeral,” she says. She spends eight hours a day in her studio, listening to audiobooks on history as she snips away at fine Nepalese lotka paper—not with a chisel, as Mexican artisans do, but painstakingly, with an art knife. It takes careful attention to keep track of negative and positive space, of past and present. But the result is that, as she and Jim celebrate their 50th wedding anniversary in a place they love, her life has found order. Seventh-generation weaver Irvin Trujillo creates strikingly personal works on his loom in Chimayó. So, naturally, he decided to work out his dream on the loom. He wove a patterned background in the Chimayó style’s characteristic red, white, and black color scheme. In the center of the piece, he depicted the shadowy figure from his dream in a way that owes less to traditional weaving than to the Japanese anime master Hayao Miyazaki, whose work Trujillo admires. The unexpected personal twist on a form he’s studied deeply was exactly the sort of thing that sets Trujillo’s art apart. “What I realized in my research was that every generation had made a contribution to the style. I had to push the tradition—I couldn’t just leave it there. So I started bringing in ideas from the culture,” he says. 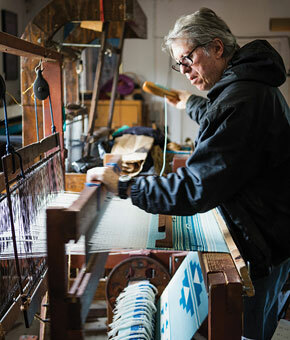 Just giving weavings titles, as he and his father, Jacobo Ortega Trujillo, started doing at Spanish Market in the 1970s, was a novel twist in a tradition long associated with frasada blankets and other household items. The response to his more expressive style has been powerful. In 2007, the National Endowment for the Arts awarded him a National Heritage Fellowship, the country’s highest honor in folk and traditional arts. Dr. William Clark in Mesilla’s plaza. To hear it from New Mexicans, Dr. William Clark might be the most beloved bandleader since Duke Ellington. “Most public school band directors and music teachers in New Mexico and the Southwest are in some way the product of Dr. Clark’s pedagogy,” Dr. Ken Van Winkle, an NMSU associate dean, told the Governor’s Awards committee. 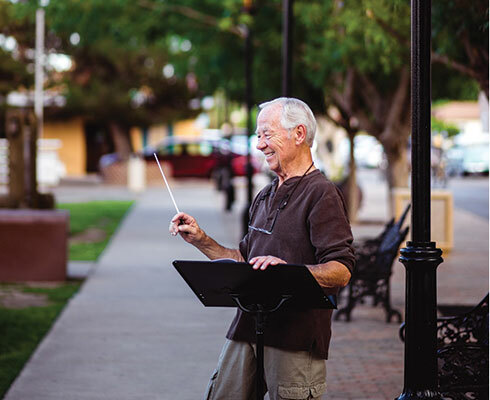 In addition to his two decades as director of bands and then head of the music department at NMSU, Dr. Clark founded the Mesilla Valley Concert Band and the Las Cruces New Horizons program, an organization aimed at helping retirees rediscover the joys of playing music. In 2007, he was elected to the American Bandmasters Association. Students of the Las Cruces legend say his ability to inspire reaches far beyond music—terms like “life-changing” are tossed around. Bravo, maestro. Eric Renner and Nancy Spencer at home in Silver City. 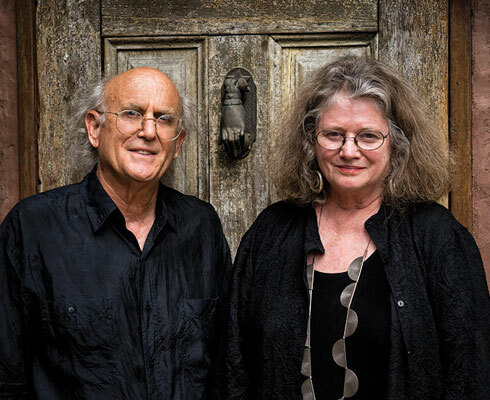 She and Eric Renner remember plenty from their three decades running Pinhole Resource, a supplier, publisher, and archive for the lensless photography they love. Like running some of the first homemade images from the fall of the Berlin Wall on the cover of Pinhole Journal, which the pair published for 22 years. Or the trove of photos they collected from Los Alamos scientists, who use pinhole cameras to document their work in the lab. In 2012, Renner and Spencer (also pinhole photographers) donated an extensive collection of photographs, cameras, and books to the New Mexico History Museum. Visitors can see the resulting exhibit, Poetics of Light: Pinhole Photography, through January 10. “We ended up with, I guess, the premier pinhole collection in the world,” Renner says.